There is only one thing that is better than creamy avocado on toast, and that’s creamy avocado on toast with just a teeny touch of buttery coconut oil. And there’s only one thing better than THAT . . . which, my friend, is this recipe. 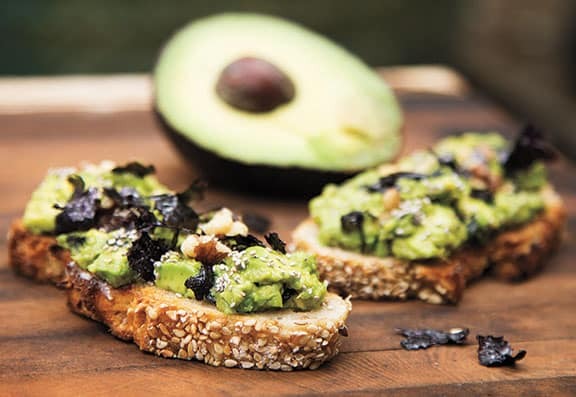 While it is pretty epic fare for entertaining, you can also prepare it family-style if you slather the whole piece of toast with avocado goodness (transforming it into the best-ever half-sandwich), instead of quartering it into bite-size pieces. This makes 16 crostini. Reprinted with permission from Superfood Snacks © 2015 by Julie Morris, Sterling Publishing Co., Inc. Photos by Oliver Barth. There is only one thing that is better than creamy avocado on toast, and that’s creamy avocado on toast with just a teeny touch of buttery coconut oil. Over a wide bowl, crumple one sheet of nori into the smallest flakes possible. Repeat with remaining nori sheet. In a small mixing bowl, combine the avocado, lemon juice, and sea salt. Mix well. Add half of the crushed nori flakes and fold them gently into the mixture to combine. Toast the bread in a toaster or oven broiler for 1 to 2 minutes on each side, until golden. Lightly brush one side of each piece of toast with coconut oil and cut it into quarters. Spread each quarter with a spoonful of avocado mixture, then sprinkle with chia seeds, remaining nori flakes, and walnuts. Plate and serve. Note: Sprouted-grain bread, which is now available at many natural food stores, has a pleasant, lightly nutty flavor and is particularly beneficial, thanks to its naturally higher protein content. Of course, you can also use any bread you like, or for more traditional crostini, use thick slices of a toasted baguette instead.